The is a translation of part of the book, ‘Joska Soos, Ik genees niet, ik herstel de harmonie’ (Joska Soos, I do not heal, I restore harmony), originally published in Dutch in 1985 by Karnak, Amsterdam. (© copyright for the translation by Dirk Gillabel, 2014). A few images are from the book, the rest I have added myself by way of illustration. The sixth chapter is not from the book, this I have written myself. Joska in front of front of his paintings. He is wearing a special shamanic amulet. This is a very important text. As far as I know there is no other autobiography, in the words of a shaman himself. Joska Soos tells in his own words, about his special birth, his younger years under the tutelage of the village shaman, his initiations, and his personal experiences with the world of sound. 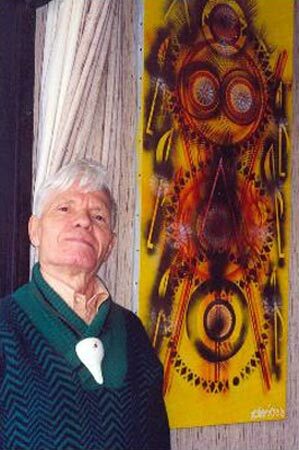 Joska Soos is the first and only shaman who has revealed the existence of the light-sound beings, of which he made numerous paintings and drawings. Joska Soos was unique in the world of shamans, but he also understood that he had to bring his message to the growing community of spiritual seekers. Many people came to him, not only for his shamanizations, but also to learn and experience his teachings. I hope you will enjoy Joska Soos’ account of his life. His teachings, also in his own words, can be found on the main page.